This course is designed for both new and experienced operators. 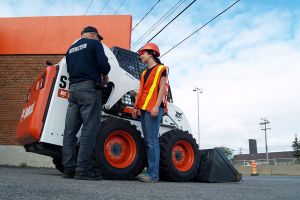 This program will discuss topics relating to the safe use and operation of skid steer loaders. The practical component of this program is conducted at the client location and instructs participants on the use of skid steer loaders at their facility. Upon successful completion of the theoretical and practical evaluations, a wallet card and all necessary paperwork for company records for each participant will be issued as proof of training.